See that, Shuttle? Yeah, that's your worst nightmare. iBUYPOWER has just shocked the small form factor (SFF) world with a new rig that's potent enough to act as your standalone gaming machine. Equipped with a menacing look, a carry handle and room for two full-sized dual slot video cards, the aptly titled LAN Warrior caters to no one outside of the enthusiast niche. For the crowd willing to shell out for the latest and greatest, they'll find a Core i7 CPU (920, 940 and 965 Extreme available, up to five ventilation fans, an optional liquid cooling system, ASUS' Rampage II Gene X58 motherboard, up to 12GB of DDR3 memory, twin GeForce GTX 295 / Radeon 4870 x2 GPUs, four internal 3.5-inch bays, up to 6TB of HDD space, up to two Blu-ray writers, gigabit Ethernet, 802.11n WiFi and a planet-killing 1000-watt power supply. Amazingly, the starting tag on this one is just $999, and it's available now from the outfit's website. Full release is after the break. El Monte, CA – April 28, 2009 – iBUYPOWER, one of the largest gaming system manufacturers in the world, is excited to announce its first small form factor (SFF) system – LAN Warrior. Unlike previous attempts at SFF gaming systems, the LAN Warrior offers enough firepower to stand toe-to-toe with even the most advanced gaming systems, with room for up to two full-sized dual slot video cards, up to 24GB of Triple Channel DDR3, and a 1000W power supply. Enthusiasts will appreciate the LAN Warrior's overclocking features and the SupremeFX X-Fi solution, which enhances the gaming experience with realistic sound-effects. iBUYPOWER also includes a carrying strap and harness system for taking the LAN Warrior on the road. "We designed the LAN Warrior for gamers that need more power than a gaming laptop can provide," said Darren Su, Vice President of iBUYPOWER. "With the space for 2 dual-slot video cards and a liquid cooled Intel Core i7 Processor, the LAN Warrior is just as powerful as systems twice its size." iBUYPOWER chose the sleek NZXT Rogue case for its 3 120mm ventilation fan ports (expandable to 5 120mm fans) to keep the LAN Warrior running cool during even the most intense battles. The LAN Warrior's ESATA, Audio out, Card Reader, and two USB ports are all conveniently located on the system's front panel. Additionally, the system's removable power supply bracket and motherboard tray make future expansion a breeze. The case also features a lock on the front cable and pad lock loop on the back panel to protect the LAN Warrior's components from theft. 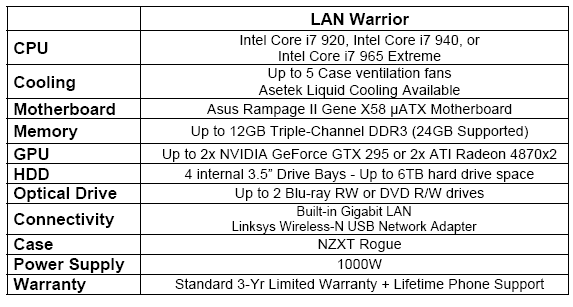 The LAN Warrior starts at just $999 MSRP and is available now exclusively at www.iBUYPOWER.com. iBUYPOWER systems come standard with 1 year limited warranty and lifetime technical support. For additional information about iBUYPOWER please visit www.iBUYPOWER.com, or contact PR representative Mark Olson at 305.576.1171 x17 or markolson@maxborgesagency.com.